Location: Helios Spa Hotel is situated only 15 minutes drive from the loveliest Bulgarian city, Varna, the Black Sea capital of Bulgaria, 30 minutes from Varna International Airport, the gateway to Bulgarian tourism and just 200 meters from the Black Sea and the gorgeous beaches of the Golden Sands Resort. 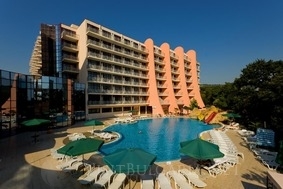 The hotel is embedded in the ancient forest of the unique Golden Sands natural park. Accommodation: The deluxe hotel rooms at the Helios Spa & Resort offers luxurious accommodation and high-spec fixtures and fittings, ranging from Standard Rooms for 2 to 3 people to Two-bedroom Suites, suitable for 6 adults plus 2 children. All of the rooms and suites have plenty of space, walk-in closets and private balconies with great views of the park or the Black Sea. All of rooms come with king beds or 2 twin beds, while the suites' bedrooms have king beds. Similarly, while the rooms' en suite bathrooms come with standard and rain showers or bathtubs, the suites' have both, and the Two-bedroom Suite even has an extra bathroom too. Wine & Dine: Helios Spa & Resort offers the most comprehensive services in Golden Sands. The hotel has three comfortable and luxurious restaurants: Demeter Main Restaurant, Dionisys A-la-Carte Restaurant and Poseidon Seafood Restaurant & Bar; exquisite cafes and bars - Hellios Lobby Bar & Sun Terrase Cafй, Artemis Juice Bar, Poolside Bar & Grill, Apollo Night Club, as well as two outdoor and one heated indoor swimming pools, children's playground and a multipurpose tennis court, basketball, volleyball and football ground. Spa & Wellness: Helios Spa & Resort offers the largest and most spectacular spa and health center in the resort. Aphrodite Beauty Spa & Health Clinic is a unique center for rejuvenation and recovery. It covers an area of 2, 300 sq.m., with 35 luxuriously furnished and equipped individual treatment rooms for facial and body massage, hydro-massage and an aesthetic therapy, rehabilitation and treatment. At the Aphrodite Beauty Spa & Health Clinic, feel the full force of hot-stone massages, whole-body aromatherapy massages and four hands massages to relax your body; try out holistic treatments, such as acupuncture and cupping massage therapy; or dedicate a few hours to aesthetic body therapies to detoxify, firm and tone the skin, and to improve circulation. Since mens sana in corpore sano (a healthy spirit is in a healthy body), guests can also take advantage of the services of the diagnostic center, which will undertake electro cardiograms (ECG), dermatological analysis as well as blood and urine analysis upon request. Guests can also undergo some physiotherapy, as well as hydrotherapy, and an endless range of body treatments, including deluxe body wraps, thalasso therapy wraps and mud treatments. - Animation; Volleyball, basketball, football, table tennis, gym. Services subject to additional payment: Safe; Imported drinks; Mini Club.